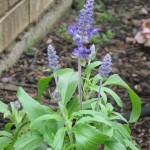 Now we have another Victoria Blue salvia blooming on the far end of the front flower bed. 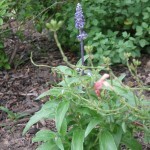 So that makes for two flowering salvia farinacea that have returned from last year. There are yet 2 more young Victoria Blues that have been slow to come up. I don’t mind their slow return, which saves me from purchasing more, but the man wants that extra pop right now. 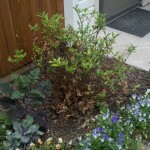 Talk about slow…the gardenia has new leaf sets, despite that it has lost about 75% of its foliage. It survived the bitter winter frost, which is amazing in itself. 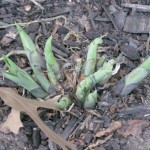 I don’t want to prune it back because there is evidence of new life on it. It’s going to be a very slow recovery. 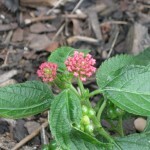 One of the Confetti lantana is putting on a set of buds. 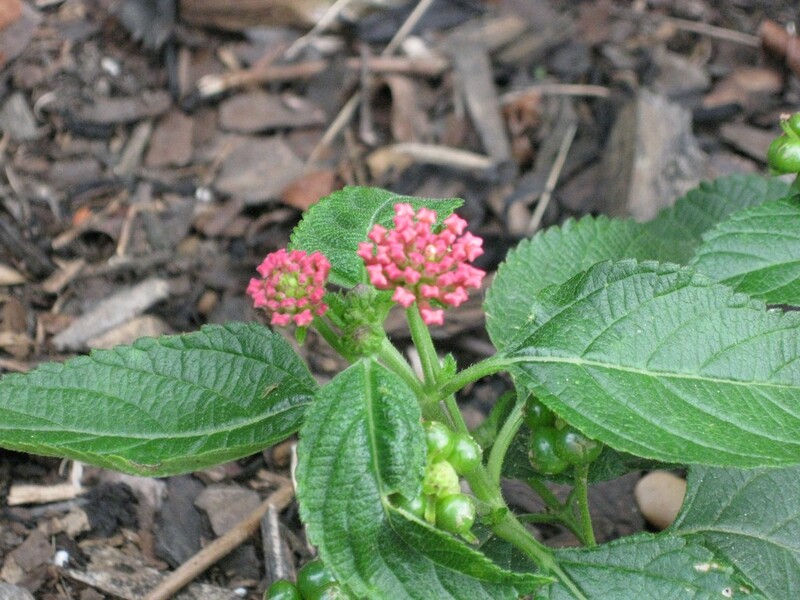 Its sibling about a foot away has been more interested in trailing rather than flowering. 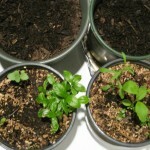 I also had some criticism for the man for planting the vinca seedlings so close to each other. They grew into monsters last year, and I don’t expect it to be any different this year. 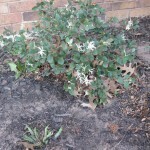 The man trimmed back our centerpiece loropetalum in this front bed, just to give it some shape for the rest of the year. I am interested in seeing it grow higher, but I won’t begrudge it a little width to shade the tiny impatiens seedlings at its feet. 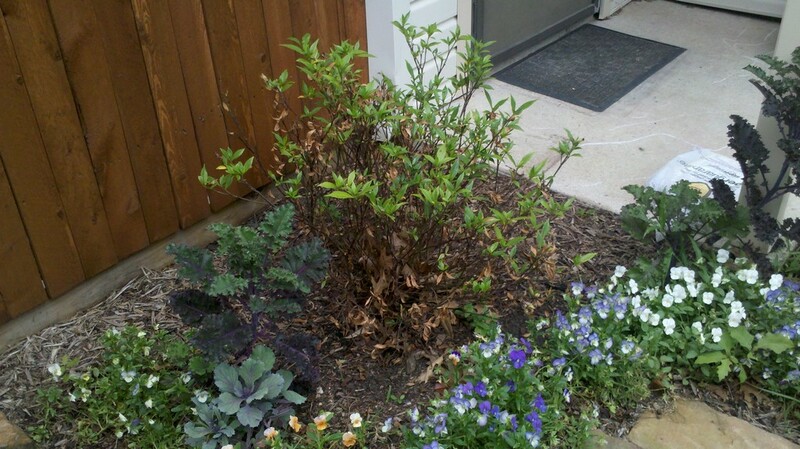 The man also hacked down the Hot Lips salvia…that thing has grown into a monster in the front bed and is in constant need of pruning. We did finally get another Hot lips planted next to the Autumn Twist azalea and expect the same vigorous growth this year. 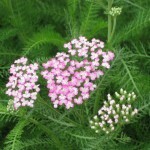 Notice the verbena colors? Maybe I don’t need Mosaic after all. 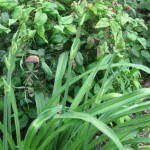 The Dallas Star daylilies are heavily laden with scapes! 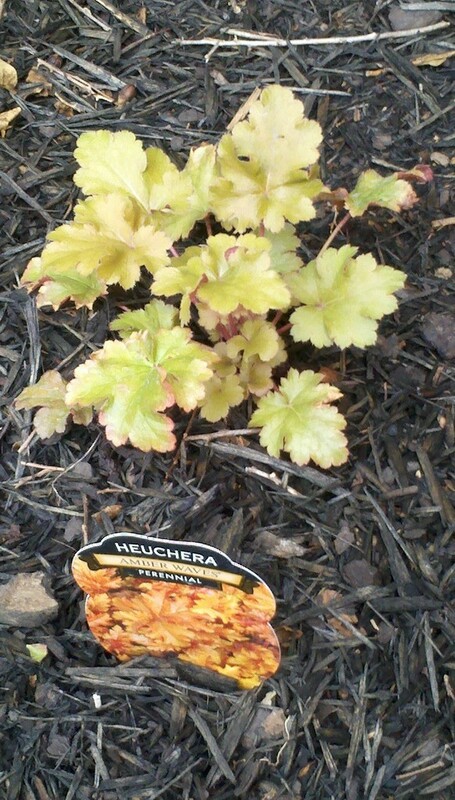 Finally, my newest heuchera seems a little lonely in its corner of the shade bed, but I hope it will be happy there. It has a caladium bulb for a neighbor…although I can’t say that I don’t want to plant another hosta next to it. 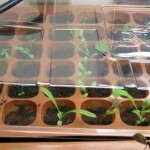 Note to self: don’t cover tender young seedlings in microwaveable plastics under the hot May sun. 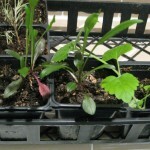 So it was that I lost 3 batches of plants: Seabreeze salvia, Lime and Genovese basil, and all of my Stardust ice plants. Back to square one. 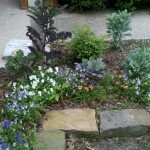 Sunday’s flower run included a 50% off all plants sale at the Lowes in Carrollton of Trinity Mills and Old Denton. 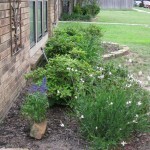 The man decided to invest in 2 2.5 quart Stella d’Oro daylilies to add to the front flower bed. We also picked up a hot banana pepper (more than a foot tall), a habanero, a variegated oregano and a Chinese eggplant (Ping Tung cultivar). All of the herbs and vegetables by the way were Bonnie plant branded; they retailed for $3.70 but at 50% off they were a good deal. We also ran by Calloway’s in Lewisville to pick up our Spider Lily bulbs at 3 for $3. The bulbs were disappointingly tiny (what’s with all the tiny bulbs coming out of Calloway’s lately), and the man and I are still debating where to plant them. Somewhere where they’ll get summer shade but fall sun, says the checkstand lady. 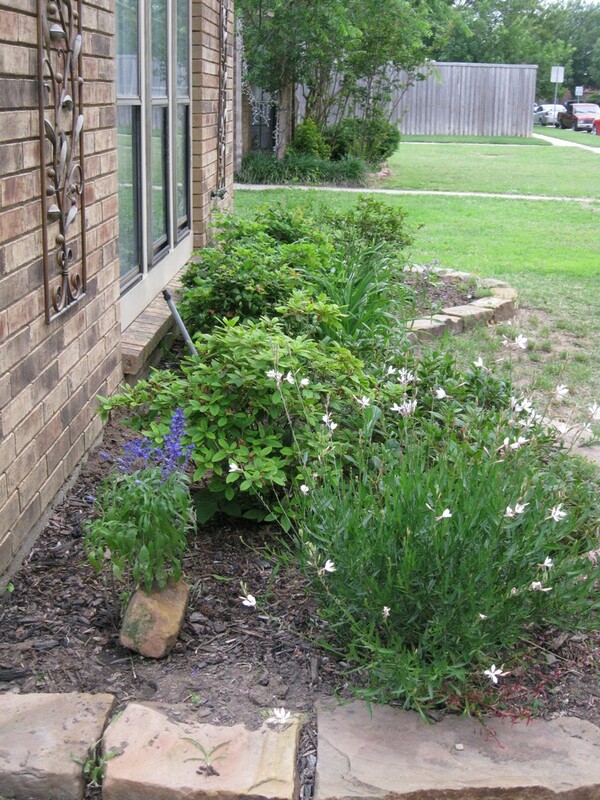 I divided and moved the picoteed dianthus in the purple bed, planted the Confetti lantanas (x2) and dahlberg daisies (x4) in the front flower bed, and all the impatiens in the shade bed. 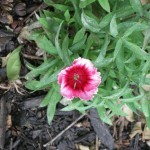 A leftover from the purple bed, Super Parfait Raspberry dianthus, has been transplanted to the shade bed near the gate. 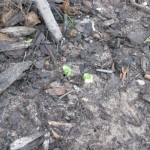 A pleasant surprise that I uncovered while weeding out the front flower bed: dozens of vinca and at least 3 impatiens seedlings. The impatiens seedlings, amusingly enough, are tucked under a layered branch of the Emerald Snow loropetalum. Like the numerous calla bulblets I uncovered and transplanted this week, the garden presents continue to appear as the weather continues to warm up. For example, one of the mums is displaying bulbs…of course, I wouldn’t have noticed if I hadn’t lifted the sprawling Oertel’s Rose yarrow–which, incidentally, threatens to fill the entire bed! 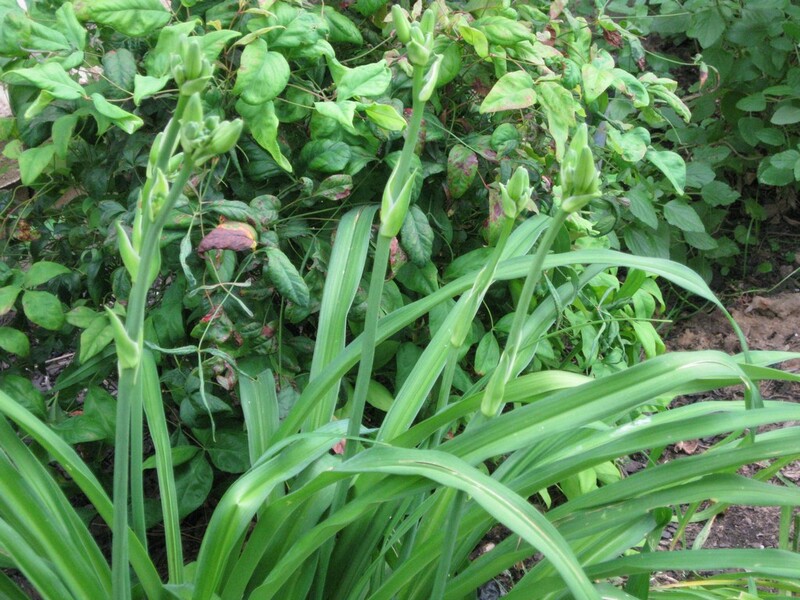 Next lilies to bloom: Red Alert asiatic lilies! Interesting to note that they all appear to be opening at the same time! It seems that both of the dianthus specimens I moved to the lily bed are Super Parfait Raspberry. I suspect that the remaining dianthus still struggling in the purple bed is also a Super Parfait Raspberry (it comes with a marker with the name Raspberry). It appears that these Super Parfaits are intolerant of heat and the harsh Texas climate. 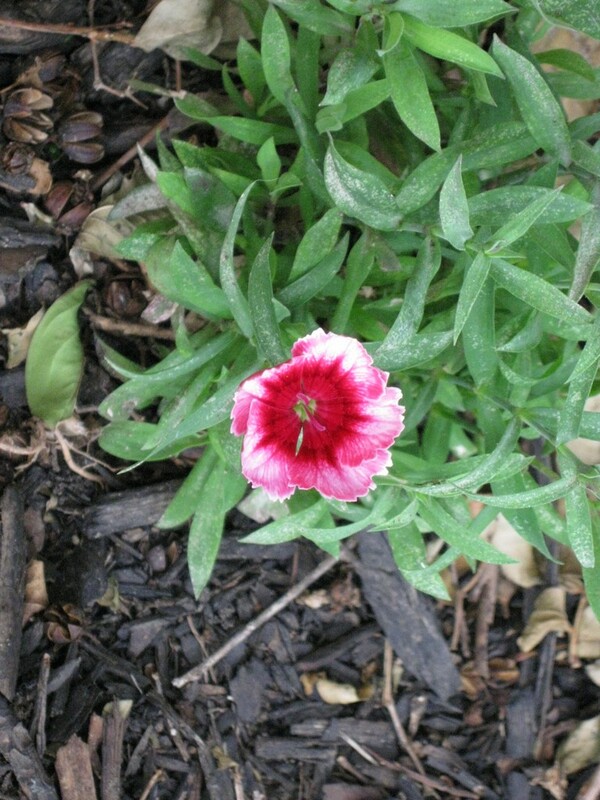 The picoteed dianthus sitting in the corner of the purple bed has escaped identification. 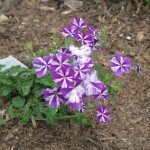 I am uncertain about labeling it a Telstar purple picotee since I only planted it last year. 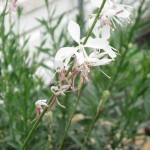 It stands to reason that it is a more recent cultivar, probably a Floral Lace dianthus. 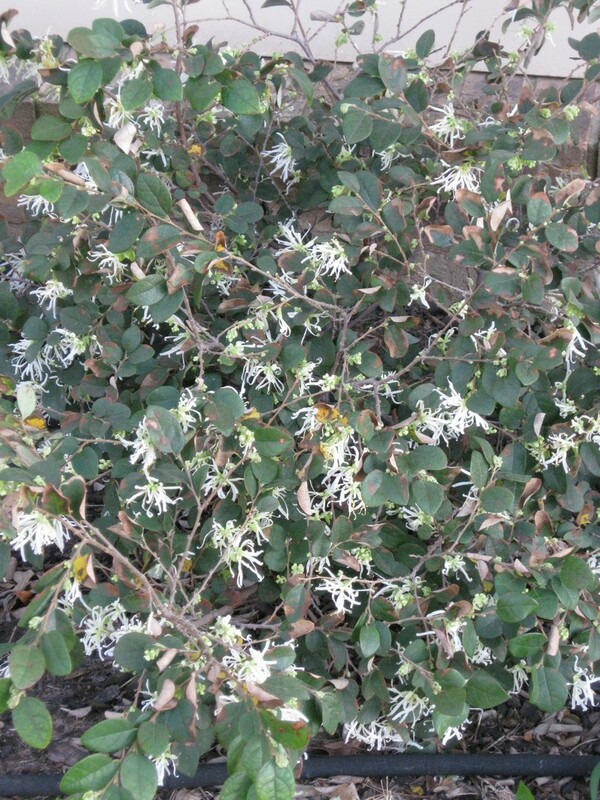 However, the foliage tends toward the lighter green of chinensis, rather than the barbatus blue and this particular specimen seems to trudge uncomfortably through our hot Texas summer. However I decided to take a cutting. With luck and some rooting hormone, I hope to duplicate it. My hopes of the bicolor salvia coccinea returning are fulfilled. 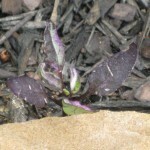 The purple bed is dotted by dozens of seedlings. Some of them even made it into my planter boxes. 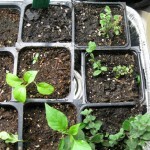 I potted a few seedlings with the intention of filling some holes in the front yard beds. I can’t wait to see them bloom. 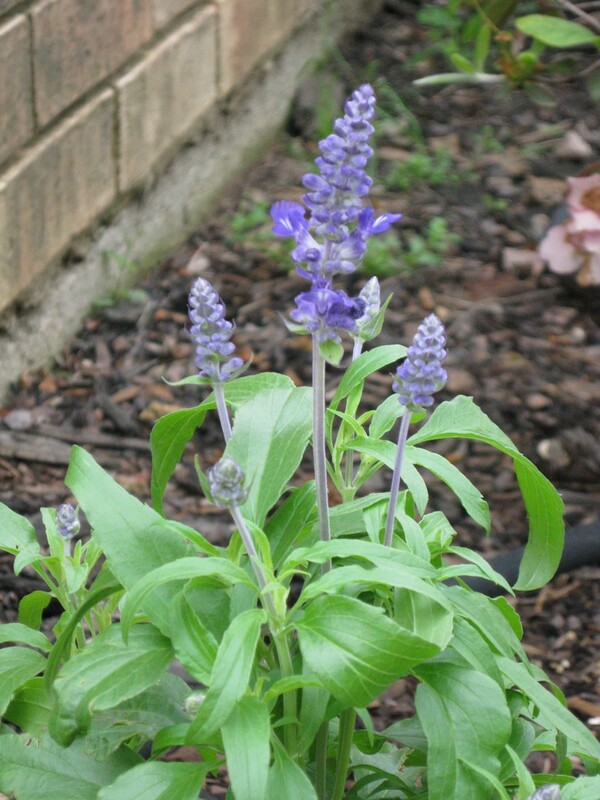 Meanwhile, the first Victoria Blue salvia bloom in the front yard bed grabbed our attention. 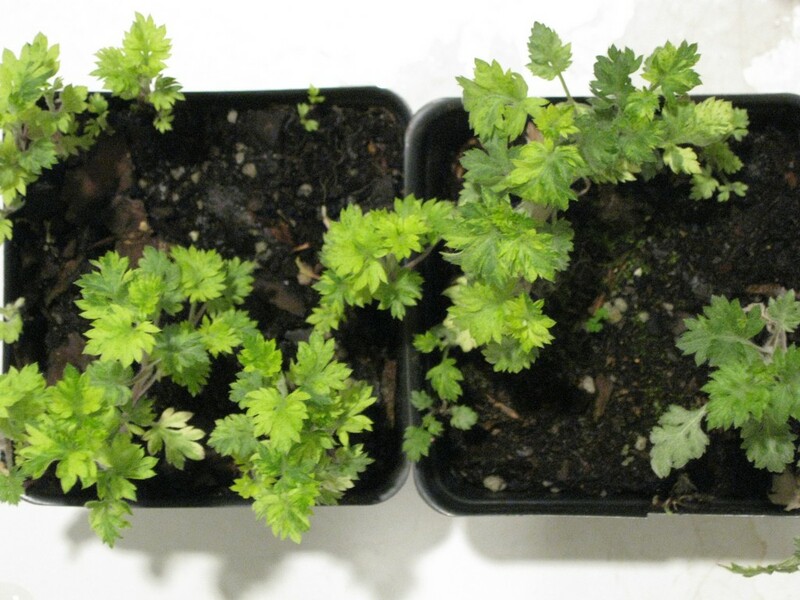 There are 3 specimens growing back from rootstock, surprising given the extreme winter weather we experienced. 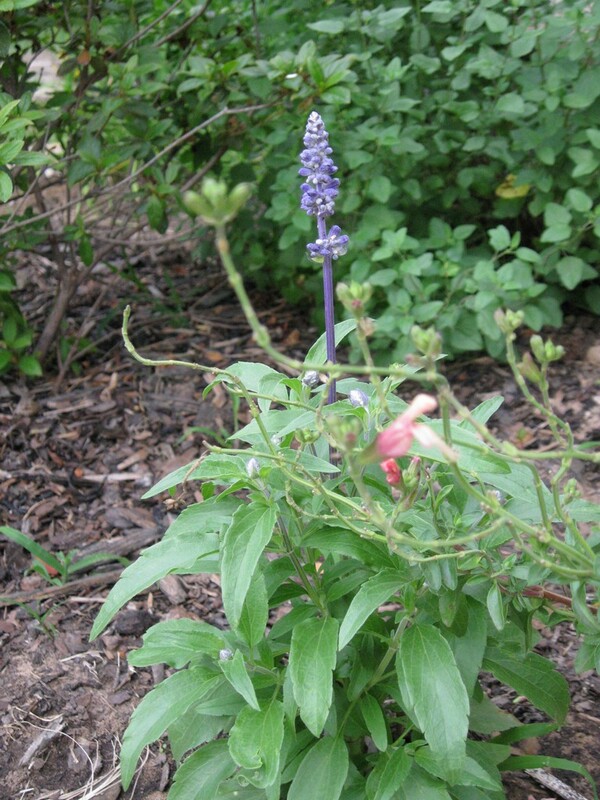 The Seabreeze salvia farinacea that I’m growing from seed seem less vigorous however. They are now being overshadowed by the Lady in Red coccinea plants. I suspect the Ladies will be ready for hardening in a week, while the Seabreezes continue to struggle. 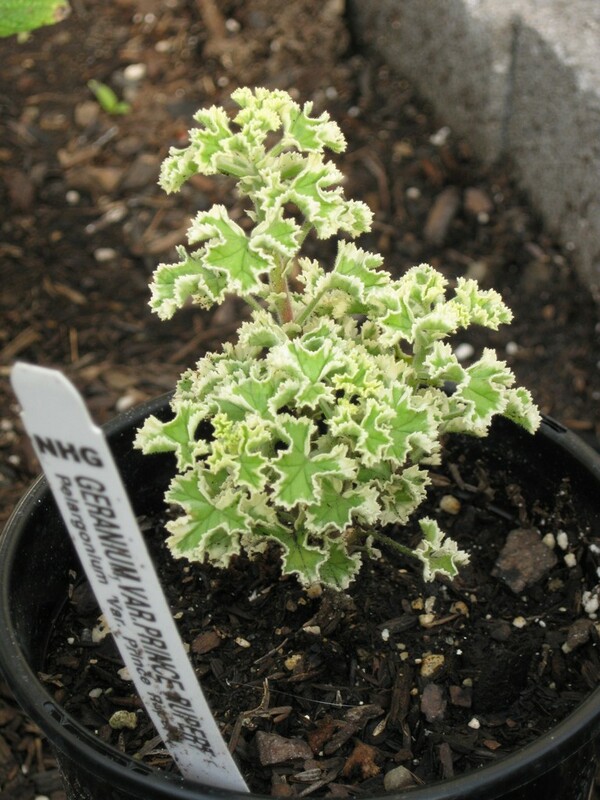 Perhaps I should have gone with the traditional Mealy Cup Sage seeds, which tend to have finer foliage, lower habit and vigorous nature than the Victorias or Seabreezes. 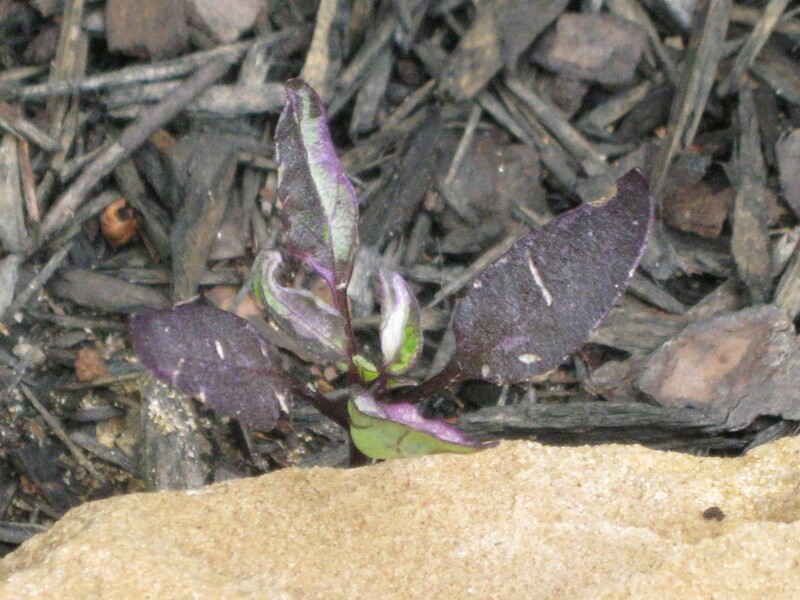 I was thrilled to find a seedling start of last year’s ornamental pepper, Purple Flash, growing next to the purple bed border. I am awaiting for it to get some height and strength before relocating it into position. 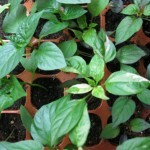 My other ornamental pepper starts have begun to look livelier. In comparison to the Purple Flash, Calico seems a little weaker, less vigorous. The Calicos also appear less variegated in this stage, though here and there, they are flecked with white. 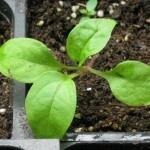 Also timid from the start are the Jupiter sweet bell peppers. While the Thai chili peppers have grown fuller with their transfer outside, the bells have been flagging, attacked by unknown predators. I’ve planted the Red Rubin basil among them in hopes of deterring insects, but I feel I may have to resort to an insecticidal soon. 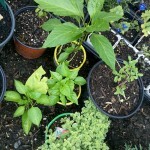 Maybe I should replant the oregano and/or thyme in the bed to offer the peppers extra protection. 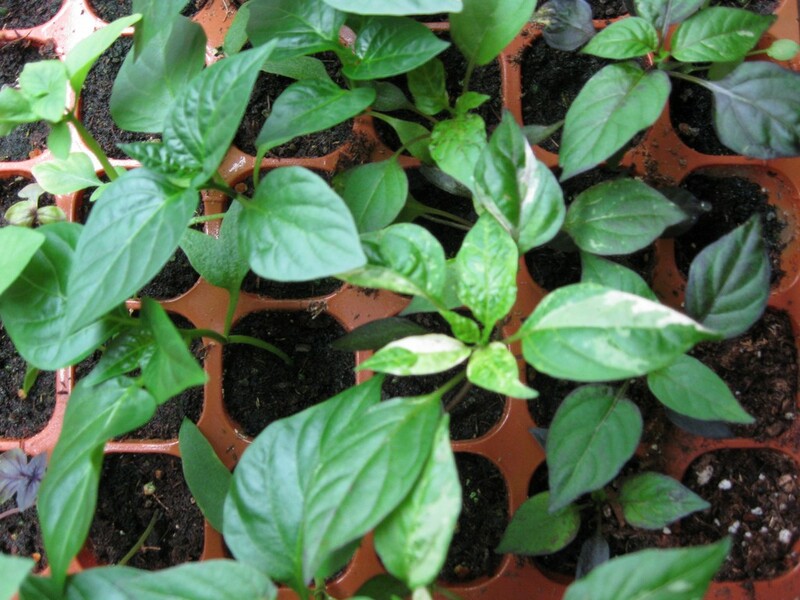 The peppers aren’t the only plants under siege. The hostas again have become prime targets in the front yard shade bed. I’ve dusted the ground underneath them with Bayer Advanced multi-pest killer, but I think I had better results with Ortho’s EcoSense insecticidal spray Unfortunately, I believe the line has been discontinued, so I’m trying their Elementals line. 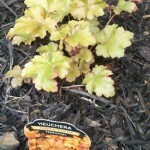 I’ve been wishing for a companion planting of heucheras or scented geraniums that will protect the hostas, but it may already be too late since the damage is extensive. I should have begun sooner with a systemic solution. 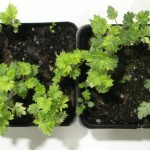 If the scented geranium didn’t grow so tall, I would be more likely to plant them into the shade bed. 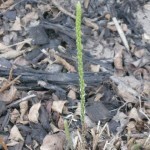 But my last specimen grew up to 4 feet tall, and seem likely candidates for back of the garden planting. I’m thinking common sage might also provide some benefits, though I determined that the Tricolor I purchased last week has already displayed some damage. I’ve taken a couple of cuttings along with a Pesto Basil cutting to root and propagate under grow lights. I’ve returned the garlic chives back indoors, and made additional sowings in all 6 of my current pots. I’ve also begun a pot of common chives. It seems the chives respond well to regulated temperatures, and keeping them under clear plastic covers has encouraged more seed starts. I’ve also laid down a thin layer of soilless mix, and they responded even better. Taking a cue from this, I spread more of the mix on top of the marigold seeds. 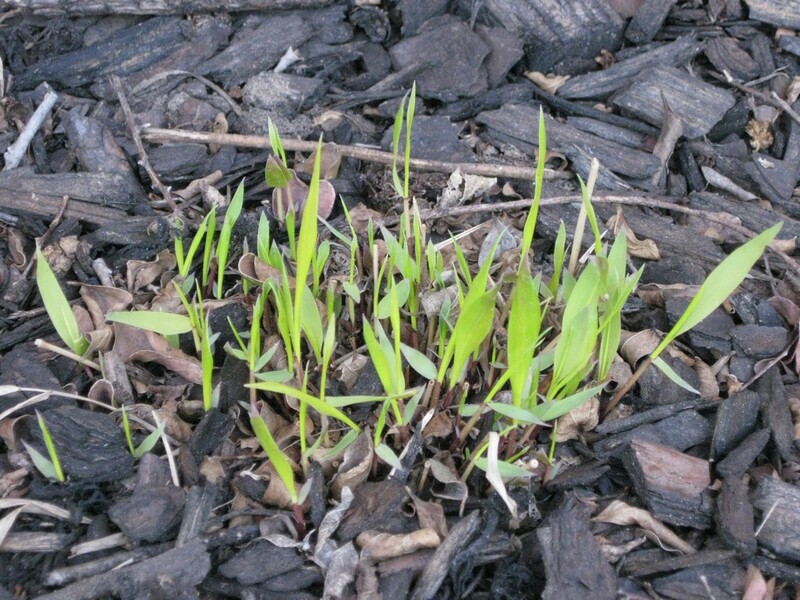 Even though they are said to be vigorous, I’d estimate only 25-30% of the unprotected starts germinated. The petunias respond extremely well to being uncovered for a few weeks. 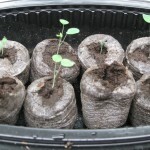 They struggled under the humidity dome for so long, and now they have quadrupled in size. I’m more conservative with the iceplants after losing the first batch of starts. Now that half of the crop are at least half an inch in size, I’ve put them out into the regular tray while keeping the weakest under cover. All the seedings responded well to a lower grow light positioning. The impatiens in particular has shown remarkable growth. I’m debating on hardening them outside soon, with planting in the shade bed when they’ve grown strong. I wish the columbines were just as vigorous. It seems the red columbines tend to be more hearty than the blues; all of the reds germinated in this second run of columbines, where only half of the blues sprouted. In the garden setting, it seems that I am down to 4 of the remaining six columbines that survived the hardening period. I suspect that these are all reds as well. For future reference, annual phlox don’t respond well to indoor lighting. 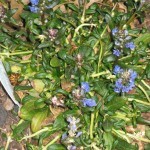 Even the specimen I brought indoors struggled under growlights, losing much of its foliage, but not its bloom power. I plan on replanting it into the blue garden, that is, if the yarrows don’t take over. The yarrows have begun to bloom; they are twice the size they were last year, and show no signs of stopping. 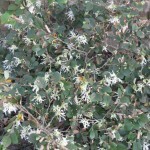 Alas I lost a variegated felicia, perhaps due to lack of sun. The side of the blue bed it was located in hardly received any light, though I imagine that will change with summer. 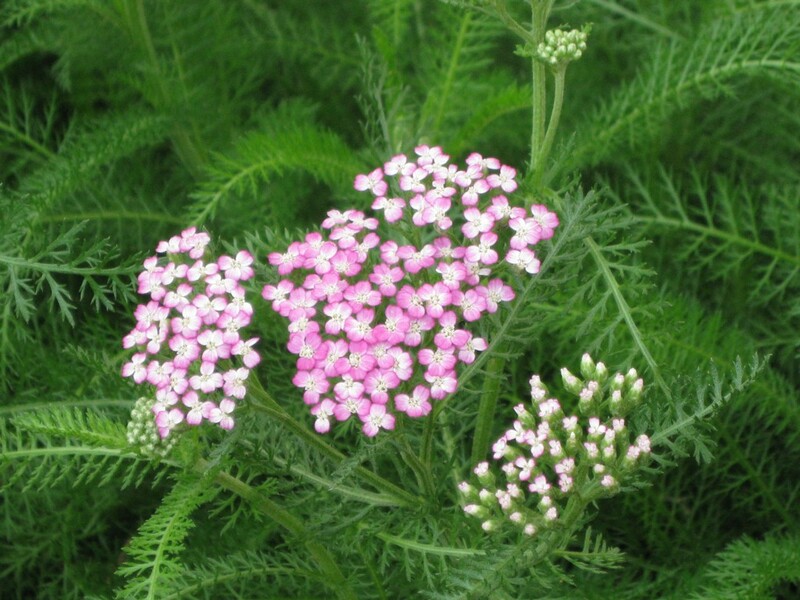 I’ve been on the lookout regularly at the home improvement stores for more specimens of felicia and verbena in hopes of finding my faves again. Meanwhile, I’ve planted out one of three Blue Knoll Chrysanthemums in the blue bed. I am trying to determine space within the lines of violas to plant the other two. This weekend I filled up the 2nd tray of Jiffy 7 coir pellets (Professional Greenhouse 72), 72 seeds in all. 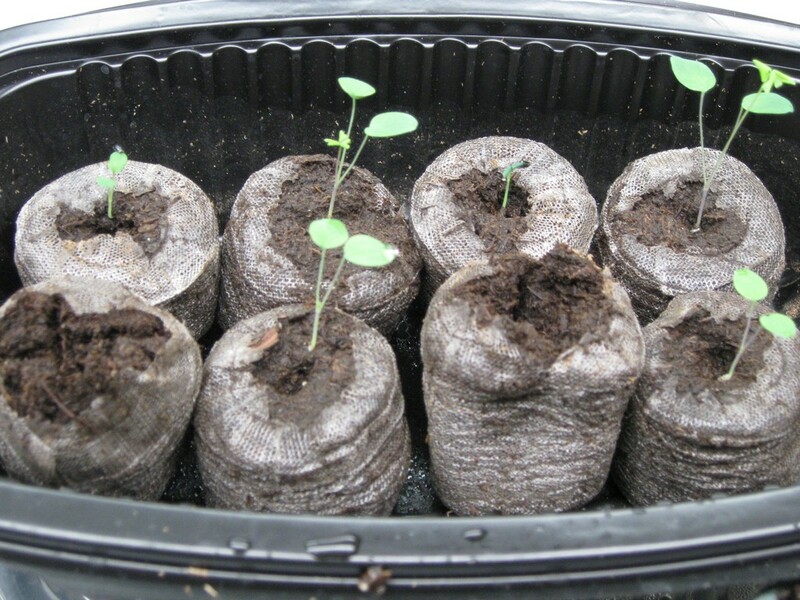 For the harder-to-grow seeds, I attempted to triple and quadruple some of the seeds in hopes that stronger seedlings result. The list? Easy Wave (The Flag) Petunias, Seabreeze salvia farinacea, Lady in Red salvia coccinea, Impatiens Xtreme Hot! 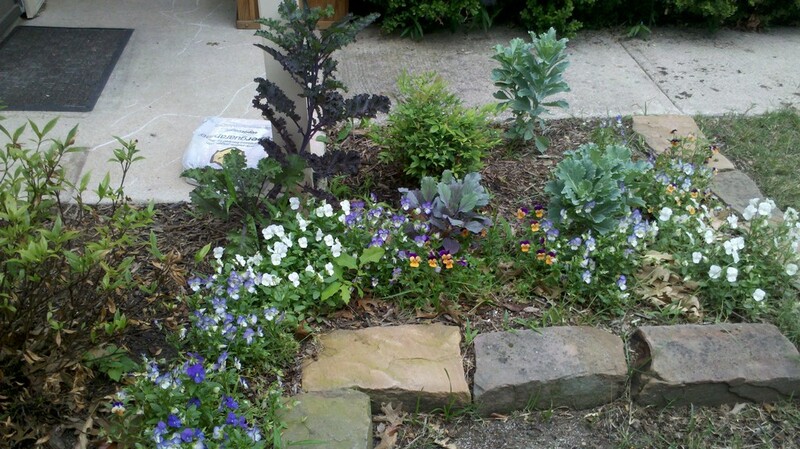 Mix, Origami Blue and Red Columbines, Stardust Delosperma, Durango Outback Mix marigolds. On our trip to NHG this past Saturday, we bought a Midnight Blue rose (with several closed buds already on it) and a Lime-scented thyme. For some reason I did not find good specimens of Coconut thyme at NHG…so I will most likely pick them up elsewhere, maybe Calloway’s. I also bought two packets of seeds: garlic chives and lime basil. Too late I discovered that a couple of chives are just now sprouting in the same pot as the Iona Blue pansy. 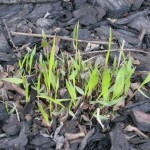 Based on a pot of chives I saw at NHG, I sowed 6-7 seeds of the used packet of chives that I had left over in 2 3″ pots. Perhaps growing them thick is the key. I brought out the tray of vinca seedlings into the light. With counter space at a premium, I’ve had to do some fancy rearranging in our bathroom greenhouse. 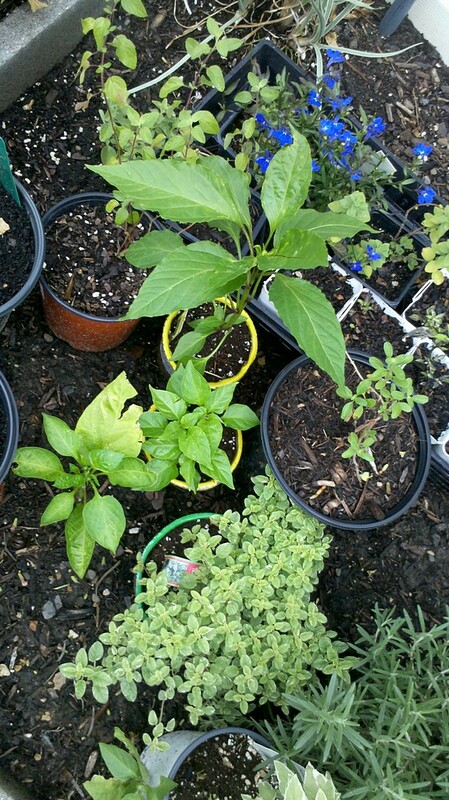 I decided to put out all the pepper plants, including the ornamentals, out in the yard to make room. I’ve also set out the tallest of the hosta plants. I imagine I also be putting out the 2 cupheas sitting in the bathtub…they haven’t done anything since I put them in there, so I believe they would prefer a stronger light source. 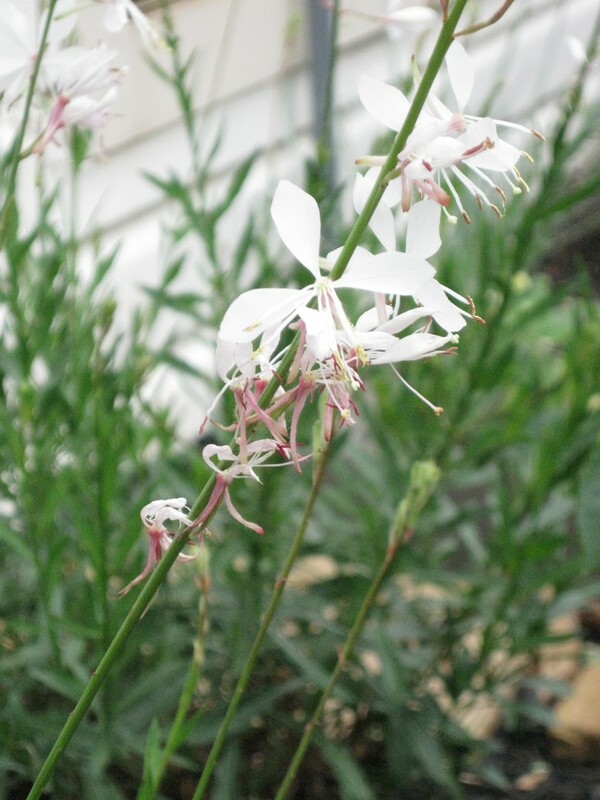 I noticed that through neglect one of the Oriental Limelight artemisias nearly died back into the pot. Luckily, a little water restored it, though some stalks were lost in the process. 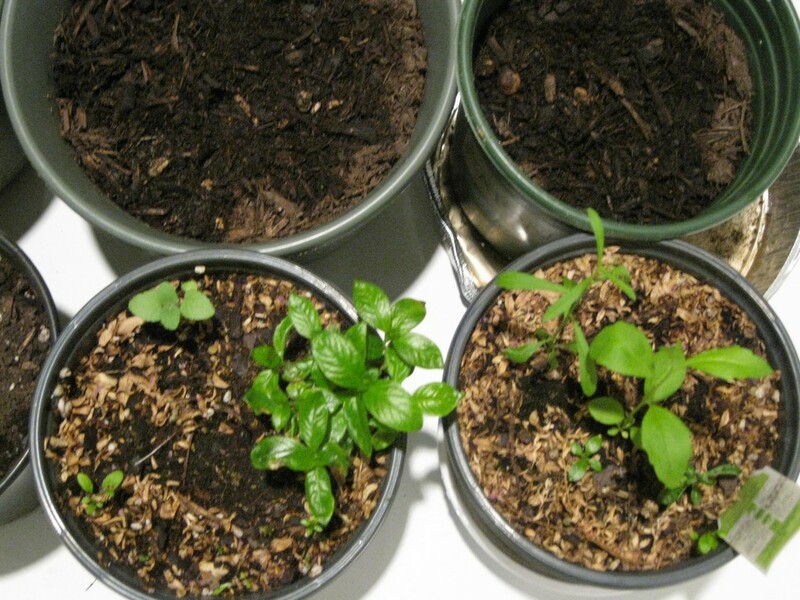 I’m still trying to decide if I should turn them loose in the landscape or just keep them potted. The following sights currently on view in the garden: plumes of foxtail ferns shooting up, a healthy crown of leaf buds on Prairie Sky Hosta, blue flowering Chocolate Chip ajuga, sword like fan of leaves on the hardy amaryllis, daffodil buds peeking through the ground, white loropetalum in full bloom, violas and scabiosa also blooming heartily, purple oxalis looking spectacular. Also this weekend, finally accomplished setting down weed mat on the salvia wall. Next mission: gravel or mulch, not sure yet. 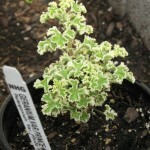 In the herb garden, transplanted one of the golden oreganos and the lime thyme. I’ll need more soil/compost to finish transplanting the rest of the herbs in the cinderblock wall. Due to the low germination rates on the blue knoll chrysanthemum, I immediately used up any remaining seed that I had left. 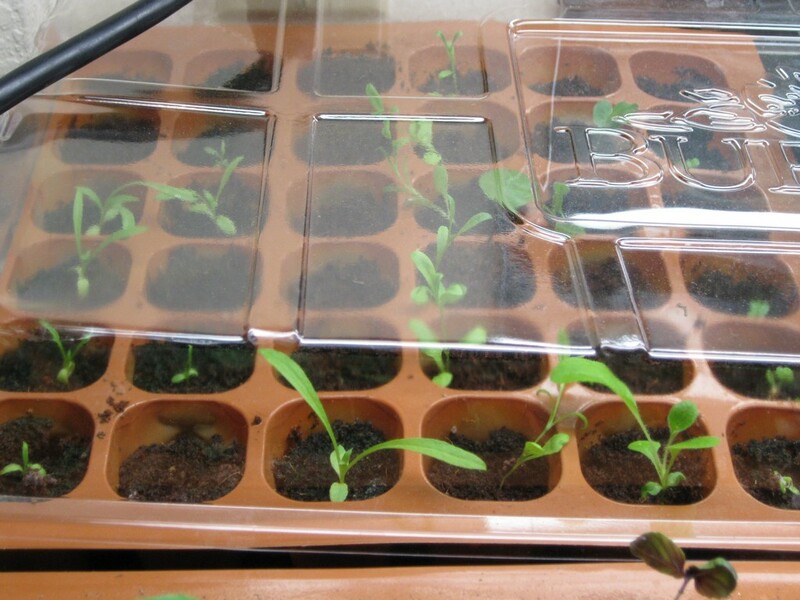 I also emptied the remainder of phlox seeds in the tray, in hopes of getting the maximum 12 starts. What is disappointing from the list above is the performance of the red rubin basil. 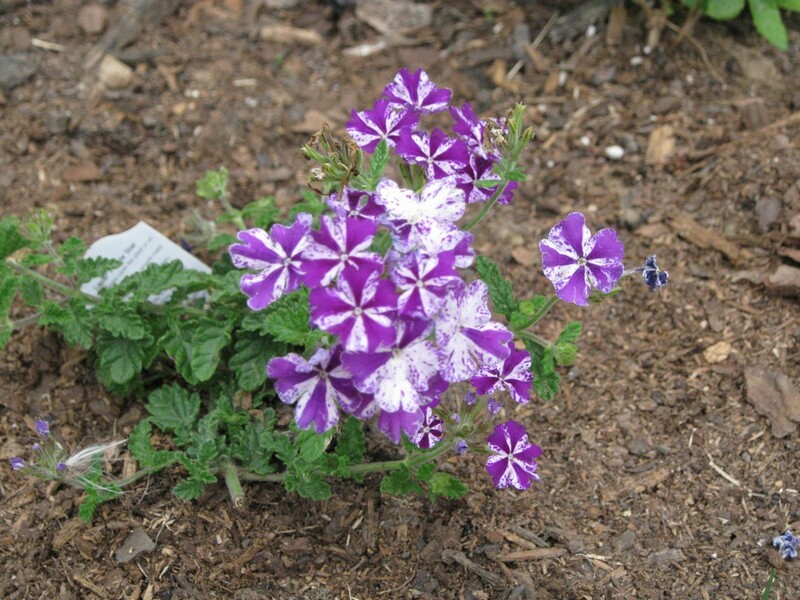 I had hoped to use a few specimens as accent color in the purple garden, but they have barely increased in size in almost a week. 4 dahlberg daisies: super fine, eyelash-shaped seeds! 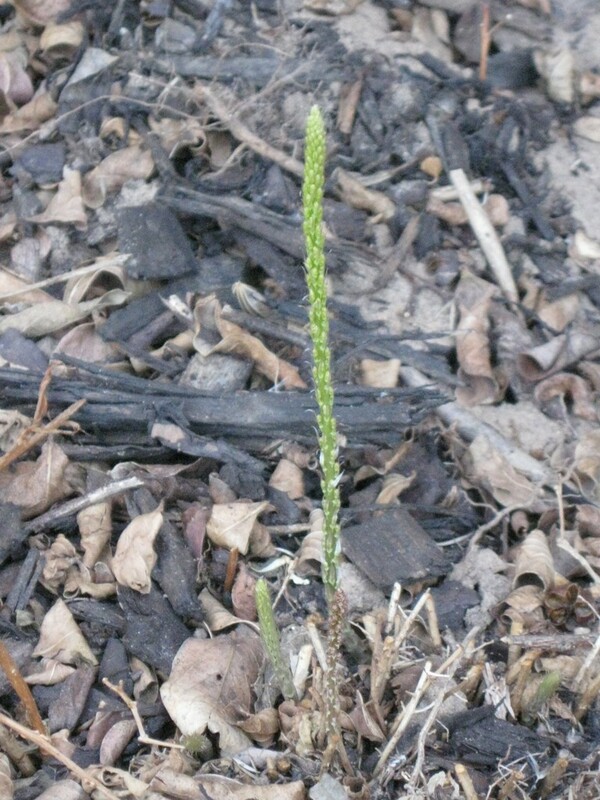 In a green quart pot I placed a root cutting from the foxtail fern…not sure it will do anything, but I’d be interested in seeing the outcome. All three of the Hot Lips salvia cuttings that I brought in are displaying tender leaves, just like the parent plant in the courtyard lily bed. Alas I have not been able to see any sign of the purple pastel that I sowed some time ago. 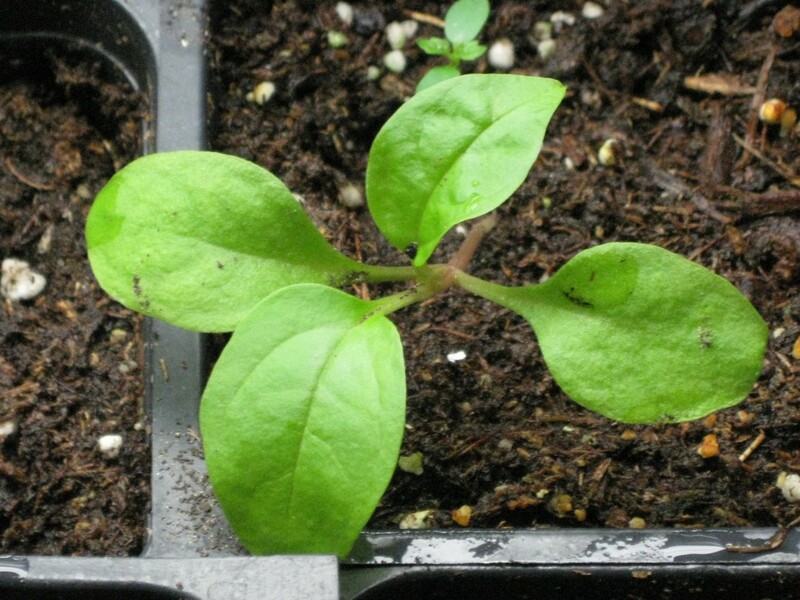 And one of the 3″ pots is hosting a salvia seedling, the likes of which I haven’t seen before in any of the greggii cultivars. Is it a white? Red? Purple? Or some other hybrid? Only time will tell. 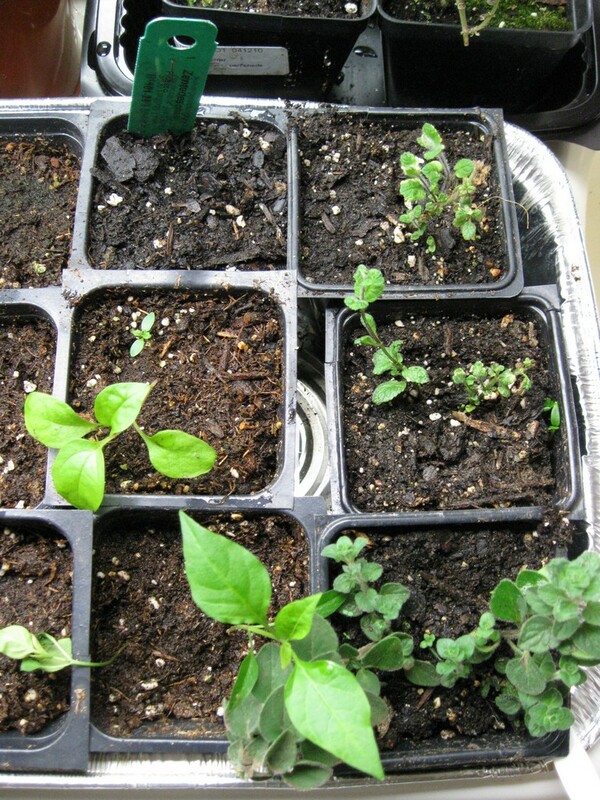 The pineapple mint (2) and hot and spicy oregano (1) cuttings have taken to their new home with vigor. 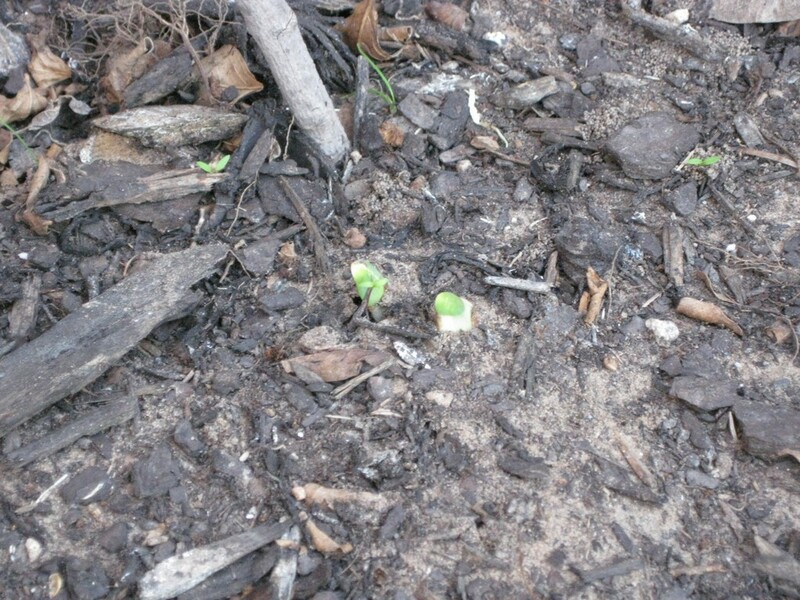 They appear to be putting out new growth–a testament to their light-loving nature. The catmint has remained tall and floppy, surprising me every day with new growth. It’s still a tender thing, disliking heavy watering. 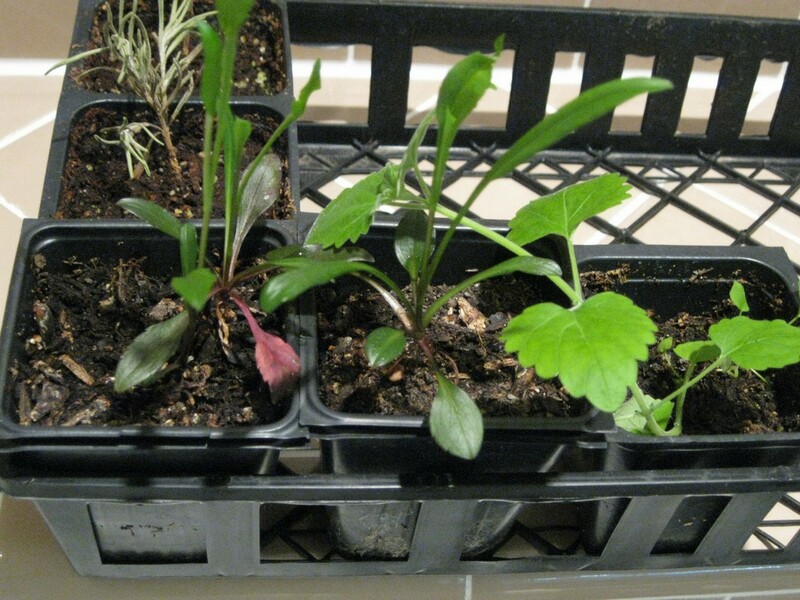 I’m not sure how I will be thinning the impatiens and alyssum seedlings; it seems too much work at this time to separate them. They still look too fragile, about 6 weeks into their lives, to be transplanted or removed from the dome protection they currently enjoy. Well, there is still another 4 weeks of March to go…no telling what growth spurts I will witness. Other statuses: asters growing tall and gangly with new shoots, rosemary cuttings looking pale and deathly, no telling what’s growing in one of the Mexican heather pots, oriental limelights perking up, felicia seem contemplative, and the columbine are starting very slowly. Now I have these two hippeastrums sitting in a bag, begging to be planted. I can’t be sure what cultivar they are, but reading suggests that these garden amaryllis may be part of a group of Sonatini hybrids. On the bag label is the distributor name Van Zyverden but their site is non-existent. Further research revealed that these hippeastrums were developed by a South African company known as Hadeco. However their site info is woefully inadequate and gave me no clue as to what to expect from the mystery bulbs. This should teach me from impulse buying flower bulbs. 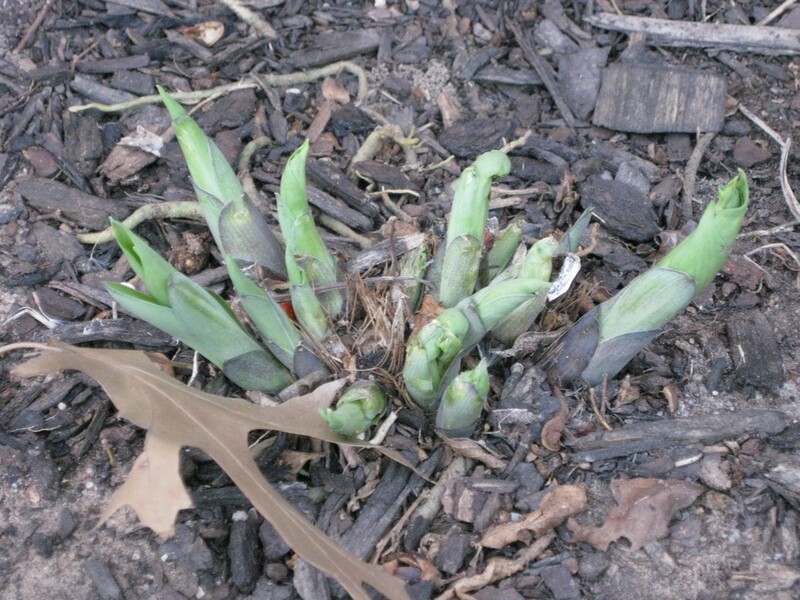 Anywho, they’re slated for burial in the courtyard lily bed. 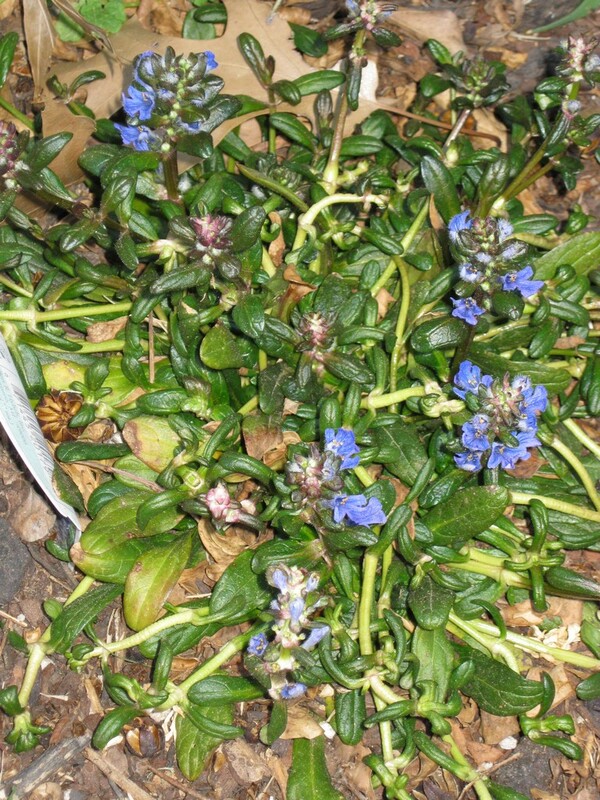 One perennial on my wishlist that has proven elusive is the Ajuga Dixie Chip. Perhaps in the coming months, I’ll be finding them at the local home improvement nursery. 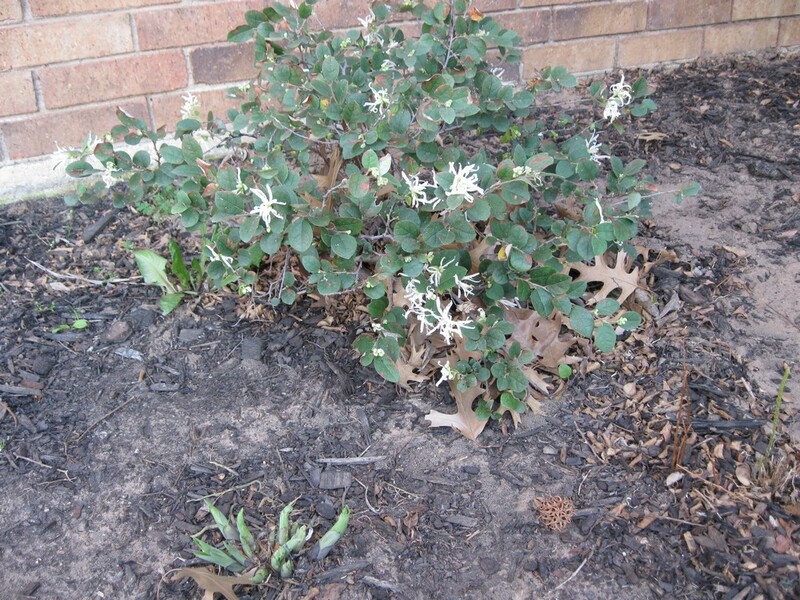 Follow blackwolf_wx's board Trees for the Home Garden on Pinterest. Follow blackwolf_wx's board Pathways on Pinterest.